By	Chris Celnar. Last edited by Marios Alexandrou on October 8, 2018. An entertained chinchilla is a happy chinchilla. So you'll want to provide as many toys and accessories as you can while being reasonable with the costs. Over the years we've tried several products with a few of them emerging as favorites. We were familiar with ferrets enjoying hammocks, however, we had not heard if the same applied to chinchillas. 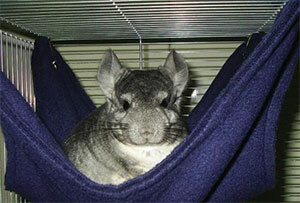 One day we came across a site with hammocks made specifically for chinchillas and we decided to give one a try. We picked out the size (there are 2 sizes) and color (there are multiple options) and ordered online. Soon enough we received the order and hung it up in the cage. So far we have evidence (for those of you with chinchillas you'll know what we mean by evidence) that our chinchillas have lounged in the hammock, however we have yet to catch them actually sitting in it (the image below is not our chinchilla). They continue to prefer to sleep in their wooden house. Sometimes it's the simplest idea that turns out to be the best idea. 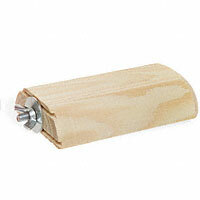 That is the case with the Leap-n-Ledge which is really nothing more than a block of wood with a screw stuck in one side to allow it to be attached to the side of a cage. This is a great way to add ledges to a cage. We often see our chinchillas perched on the Leap-n-Ledge. I recently bought my chinchillas a wheel but a friend (who also owns chinchillas) told me that wheels are bad for them. I am unsure whether to continue allowing them to use it, but they absolutely love running in it. Any suggestions? Wheels are fine. They should be big enough for a chinchilla though so that they're not forced to bend excessively. Also, the part that the chinchilla runs on should be solid so that a chinchilla's feet can't get caught while they run. Get them the disk, it's much better on their backs. I profess I'm dumber than dirt when it comes to chins. But the habitat I built indoors is 18"DX8'HX5'W. I staggered shelves, put in some manzanita branches, a small tire (they use as a wheel), a hammock and interchangable toys to play with. The nesting box is now on the floor. We now have a baby. I've removed high things until the baby gets older. I do not want it hurt as the little bugger climbs up the side if it can. They are an amazing source of wonder to me. I appreciate everyone's input and info. It has been such a great help. My chin has an appetite for fleece, should I remove it from his cage? He has plenty of chew toys, it's just like he wants to try to nibble new things. I have purchased the smaller ferret hammacks for all six of my chinchillas. I have found that 4 of them use the hacks to sleep in and run though as they are jumping around their cage. I also use the ledges both wood and lava to give all my chinchillas more jumping spaces. I also give them the round cat toys with the slits in their cagez and at night we can here all the bells ringing as they jump around with them. I have also looked every where for the Leap-N-Ledge!!! Where are they?? Where can you find the Leap-N-Ledge?? I have looked every where for them!!! Amazon.com has Leap-n-Ledges, for pretty cheap too. My chinchillas LOVE them. Definetly a must have. My chinch Paco chewed his hammock a lot which was made out of fleece as they will chew on anything you give them, but my chinches son Pasa who was a really big eater and owned by? my friend who I gave a hammock to ate too much of his fleece hammock one day and it killed him so in honor of Pasa's memory I am putting this out there and fully believe that hammocks are not good for chinches even including ones made from fleece. In the end they will eat it and it can cause their death. We have proof of or chinchilla Grimm sleeping in his hammock, that seemed to be the one thing he loved to do. It was the cutiest thing to see him sleeping in his hammock. One of the things that we learned is that you have to make it easily accessable for your chinchilla to climb in and out of a hammock. We had hung the hammock by all four hooks and Grimm decided to re-engineered the way it hung. He chewed off one of the corners that had a hook and the hammock hung by 3 hooks and thats the way he wanted it. My Chins (freddy and gizzy) love <3 to play with this little bell, that they chewed of their hay ball thing. They carry the bell too in their mouth all the time...and throw it to one another, kinda like catch. its soo cute. My Chinch Nibbles LOVES the small soft toy stuffed animals that are meant for small dogs. He loves to bite on them and carry them around in his cage at night when he thinks no one is watching. The site owner is using a pretty low tech way to take orders. The form you fill out is basically just sending an e-mail. At some point you should hear back about your order with details of what to do next. If you've been waiting for a long time, it could be your e-mail is being flagged as spam. When you ordered the hammock what did you do and what form of payment did you use? Because i keep trying to order one but nothing happens so i keep sending e-mails. Can you please help? I've found that another thing my chinchilla likes to play with is the bells with the chunks of wood on a chain that hangs from the cage. I found them in the bird toy section of petsmart, and he's constantly playing with those as well. It's funny how the simple things seem to be the favorites. Just like kids that play with the cardboard box that an expensive present came in! Let us know if you come across other things your chinchillas love to use. I recently bought this toy for my chinchilla when I expanded his cage for more play room. He LOVES this thing. He likes to sit on it and watch whats going on and he also likes to nibble on it occasionally.